Disclaimer: The provided tutorial is a demonstration of circumventing a DRM strategy, and should be used for educational purposes only. So yeah guys, I haven't been too active for a while, and I decided to make a tutorial on how to crack Cydia Apps/Tweaks. At the time of this writing, this is the only tutorial out there, and I'm sure some people are interested on how cracking works. MacOS X with Hopper Disassembler. (If you don't have a Mac, you can use Windows with IDA Pro.) Note: You will need to "acquire" these, if you need some help with that, PM me. Filza File Manager or iFile - You need one of these, I prefer Filza. dpkg-deb - once again not required, but I'll explain later. Alrighty fellers, today we will be cracking the app "BackupAZ2". 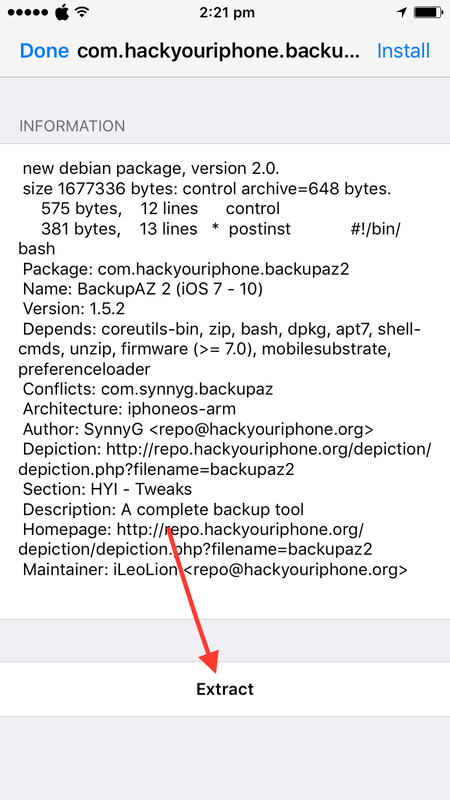 This is a Cydia App which will backup various system files and other stuff to make restoring Cydia stuff easier once you jailbreak on a different iOS version. You can download the app from the link that I provided, and it is uncracked, so once you install it, you should be getting some kind of error about piracy. Another thing that I want to point out is that I am a noob, maybe an experienced noob in this stuff but still a noob, so I will be explaining this stuff in noob explanations. Pretty much this is the piracy message and it tells us that we have pirated the app, and that we have to buy it to actually use it. Well, maybe we don't want to do that, so that leads with no other choice but to crack the app. In there you will find the .deb file that you recently downloaded. 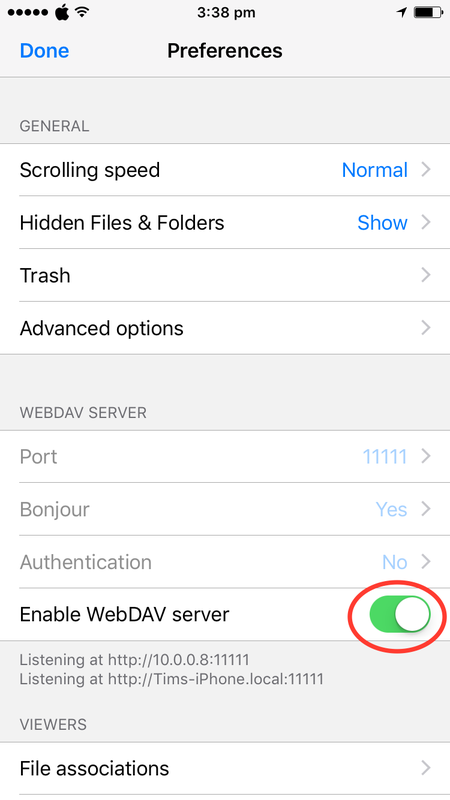 To move it from that location, press "Edit", then select the .deb file, then press "move" on the bottom left, and move it to a convenient location on your iDevice, such as /var/mobile/Documents/cracking. 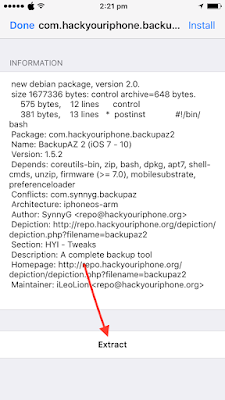 Next, you will want to unpack the .deb file, either on your iDevice or on your Mac. To do this on your iDevice, you need Filza. Simply press on the .deb file and click on "Extract" on the bottom. You should now end up with a folder with the same name as the .deb file, other than the fact that it is a folder. In that folder you will (in this case) end up with 3 Separate folders - "Applications", "DEBIAN", and "Library". 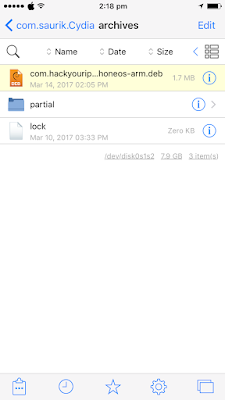 For people who want to move the .deb to their computer and then unpack it, you can do it this way. Move the .deb file to a convenient location as we did previously, then press on the settings/gear icon that Filza has. 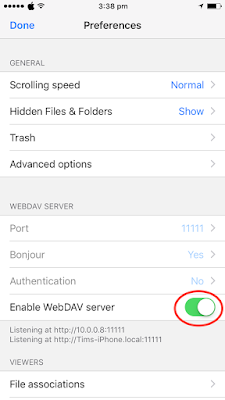 Next you will need to enable the "WebDAV server", and then navigate to the website it shows underneath, and then download the file from your web browser onto your computer. This should be pretty straight-forward, but if anything confuses you, just ask. Note: outputFolder should actually be a folder, either on your Desktop or somewhere else. 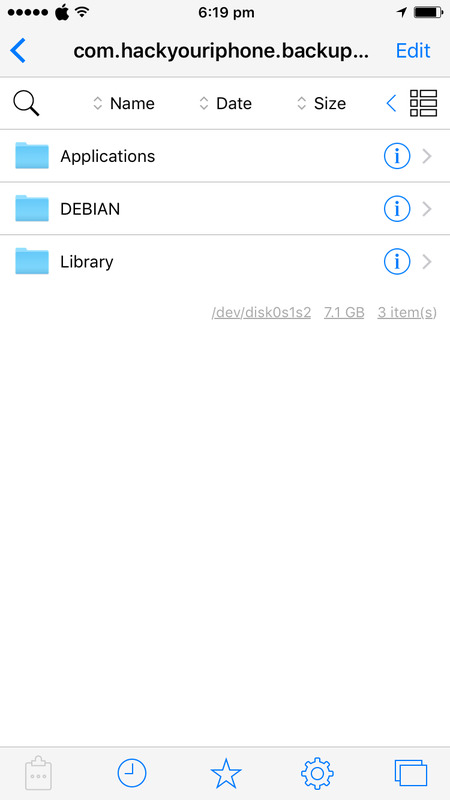 This will create the same 3 folders as it did on your iDevice in the folder you specified as outputFolder. 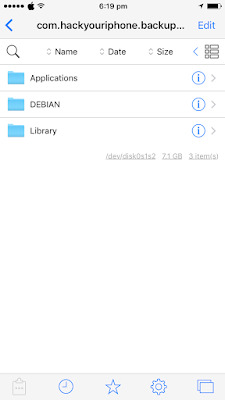 If you unpack the .deb file this way, then you are already set, because the files are on your computer, if you unpacked the file on you iDevice, then you can either create a .zip of all of the folders, and move it to your computer, or move every single file back to your computer which is cumbersome. This is the end of part 1, unpacking the tweak. Even though this seems like a complicated process, it is used every time to move your files over. I will upload the actual cracking part next.